A celebration of street food traditions, EATS (Eat Along the Street). This event brought out some of Philadelphia’s food trucks. Along with some fabulous cuisine, EATS featured a little culinary competition, where some of Philadelphia’s most popular chefs were in attendance. They prepared dishes reflecting authentic street food from around the world. There was also a great panel of judges and VIP tasters, who got a chance to “throw down” their votes for the best bites of the night. I also got to see for the first time a dragon dance, which was quite different than anything I’ve ever seen. The benefit went to the Wat Bodd Voraditth Orphanage in Thailand’s Angthong Province, and Children’s Village, a nationally accredited early learning program, located near Philadelphia’s Chinatown. Now to the food. We started outside with some of the food trucks. Didn’t get to try all of them, but I did enjoy an amazing Habanero Ginger Pork Meatball, which was seriously my favorite thing of the night. It was outstanding. My hat goes off to Jackie’s Food Truck on that one. Also have you ever had brick oven pizza from a Food Truck? Well these guys had it. Nomad Pizza… You would never believe that this could be made and taste as amazing as it did. We headed back inside for some competition. Here is what we had. Tony Clark – Valley Forge Casino: Steamed bao with BBQ shrimp, pickled vegetables, and five-spiced bacon. Clark Gilbert – Bisou on Main: Pork and shrimp sausage with pickled slaw. A take on Thai sausage made with pork cheeks and studded with shrimp. The ultimate surf and turf slider. Adam DeLosso – Garces Restaurant Group: Mortadella corn dog with housemade mustard and truffle turnip relish. Tim Spinner – Cantina Feliz: “Fish taco” with Hawaiian Kampachi, lemongrass-coconut sauce, papaya, and mango. Chad Rosenthal – The Lucky Well: Memphis Pie: Handmade pie crust, filled with backyard Ambler smoked pork shoulder, Homemade BBQ sauce, and slaw with a kick, finished with a pickle trio. They all had their unique taste, but the winner of that round for me was: Tim from Cabtina Feliz, hats off to you chef. Chaz Brown – Cubana Social: Chicharrones cubanos (Cuban pork belly) with pickled melon, habanero vinegar, jungle nuts, and cilantro. Sylva Senat – Tashan: Sylva’s Slider: 21-spice pork tenderloin sliders on a Pav bun with mango mayo, baby arugula, and pickled cucumbers. Greg Vernick – Vernick Food & Drink: Ginger chicken rice, an interpretation of the classic Hainanese dish common in China, Singapore. Aimee Oxely- Talula’s Garden: Gooey cheese and mushroom crepes. Richard Landau & Kate Jacoby – Vedge: Korean mushroom tacos with kimchee “crema”. Marcie Turney – Barbuzzo: Indian turkey khema kabob with fresh chickpea salad, yogurt, and mint. This one was actually a tie for me: I really enjoyed Vedge and Cubana Social. The winner of the night was Marcie Turney – Barbuzzo: Indian turkey khema kabob with fresh chickpea salad, yogurt, and mint. People Choice was Tim Spinner – Cantina Feliz: “Fish taco” with Hawaiian Kampachi, lemongrass-coconut sauce, papaya, and mango. 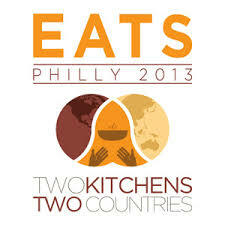 Congrats to all the chefs and for supporting such a great cause. All in all it was an amazing night with friends.